Immortal Regiment march, Moscow, Russia, 2015. Source: RIA / AFP. To be clear, these Muscovites did not come out to “hail the government,” in the words of Ban Ki-moon, but to honor this crucial date in Russian history. The Soviet Union lost over 26 million people in this War, most of them—civilian, according to official estimates. Yet it was also responsible for 80% of Nazi German losses, with the second Allied front opened only in mid-1944; thus, this victory is rightfully theirs. Because this War literally touched every family in the country—not just at the front, but also at home in industrial production; from the 872 days of starvation during the siege of Leningrad to the million Soviet casualties paid for that famous turning-point victory at Stalingrad—it became the great consolidating experience for the USSR. That said, the Immortal Regiment is riding the same wave of patriotism that first rose with the Sochi Olympics and Crimea’s reunification with Russia in 2014. In that sense, most of the country’s citizens are indeed supportive of their government’s work, and the ratings reflect that. Immortal Regiment, St. Petersburg, Russia, 2014. Source: Dmitrii Lovetskii. This kind of solidarity is of greater significance than may seem at first glance: slowly, Russians are forging a new ideological path, in which they see themselves as part of a unique civilization that is neither West, nor East, but the Great “In Between,” like the dual-headed Byzantine eagle they inherited hundreds of years ago. You’ve had whole centuries. We—a single hour. Indeed, the post-Soviet experiment of trying to be part of the contemporary Atlantic-dominated West as its client (some would argue that it is not representative of old Europe)—at times, with disastrous consequences, like the 1990s IMF-run economy—is over. Russia’s assertion of its interests, as modest as not wanting NATO on its borders, led to ‘punishment’ through economic sanctions and a renewed policy of containment, including a sanitary cordon from the Baltic to Ukraine, thereby signalling the failure of this experiment. In this watershed, the foundational and age-old aspects of Russian culture are finding their way out to the surface, modestly challenging globalization, in initiatives like the Immortal Regiment. The latter represents traditional ancestor veneration by using an Orthodox-inspired form, as I explain below. 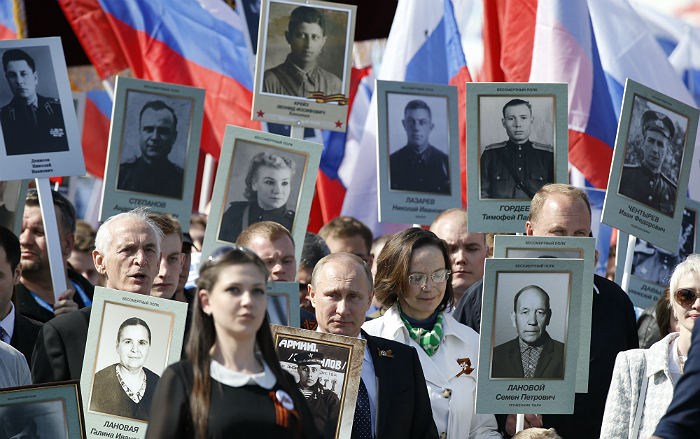 President Putin participates in the Immortal Regiment march in Moscow, Russia, 2015. Source: Reuters. 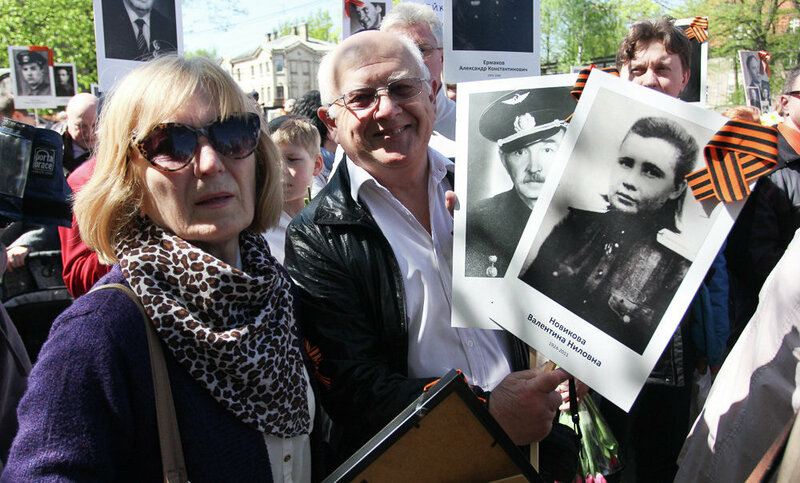 Like all grassroots initiatives, the origin of Immortal Regiment marches is difficult to pinpoint. What is certain is that they were born in Siberia. Some attribute them to Gennadii Ivanov, a pensioner in Tyumen, who seems to have been responsible for small-scale marches in 2007-2008. Others claim that it was the town of Tomsk that held such events starting from 2011. Its Tomsk coordinators, Sergei Lapenkov and Sergei Kolotovkin, simply noted that as time went on, there were fewer and fewer veterans left. One way to keep their memory alive was to march with a large family photograph—something that anyone could relate to. Whatever the case may be, by 2013, the idea spread to 120 locations in Russia and the near abroad. This year, the total number of participants was an impressive 12.5 million, half a million of them in Moscow alone; President Putin and the city’s Mayor Sobyanin joined the event carrying family portraits—not as officials, but as ordinary Russians, who, too, were directly affected by this War. The event even included places that are not normally associated with a positive view of the Soviet legacy, like Latvia. Whereas there are certain problems in exporting specifically Western concepts outside the West, is this grassroots event not a testament to a strong civil society that Russia’s critics claim is absent? Immortal Regiment, Riga, Latvia, 2015. Source: BaltNews.lv. Immortal Regiment, Novosibirsk, Russia, 2015. Source: RIA. And it is the specific form that the Immortal Regiment initiative takes that is especially noteworthy. March participants mount enlarged photographs of their family members on placards, often labeling them with their names, military status, and dates of birth and death, as well as decorating them with St. George ribbons. Some also bring balloons and banners along, like those indicating the name of the event or the replicas of the historic Soviet flag used in the Second World War. Witnessing a sea of people voluntarily march with such images is reminiscent of the Orthodox Procession of the Cross. Theotokos of Kursk. Ilya Repin. 1880-1883. 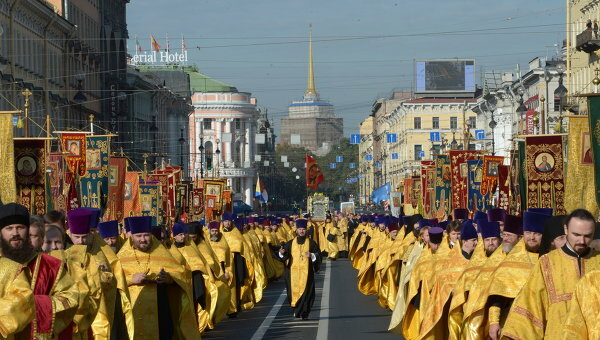 Cross Procession, St. Petersburg, Russia, 2013. Source: RIA. 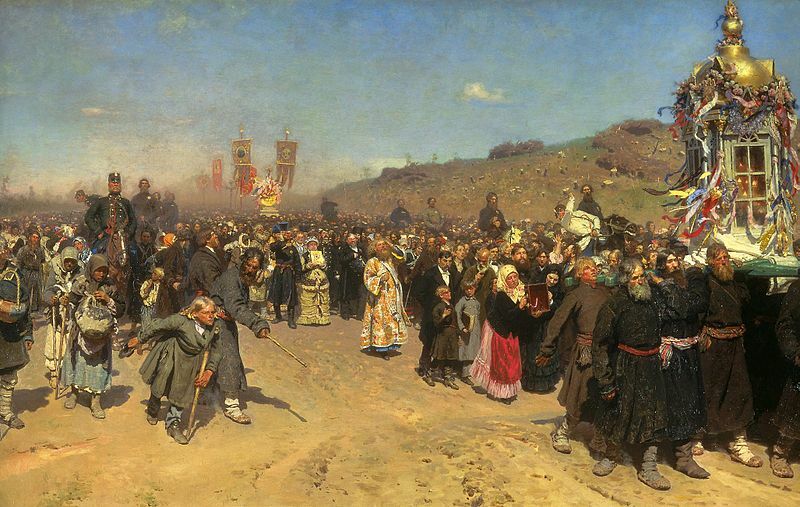 Whereas Russia is a multi-religious society, the majority of the population is at least nominally Orthodox Christian and observes major feasts and customs. On important feast days, particularly Easter, clergy carries banners, a processional cross—hence the name—and icons around the church, followed by the parish members and accompanied by singing. A Cross Procession can also take the form of a pilgrimage from one location to another. 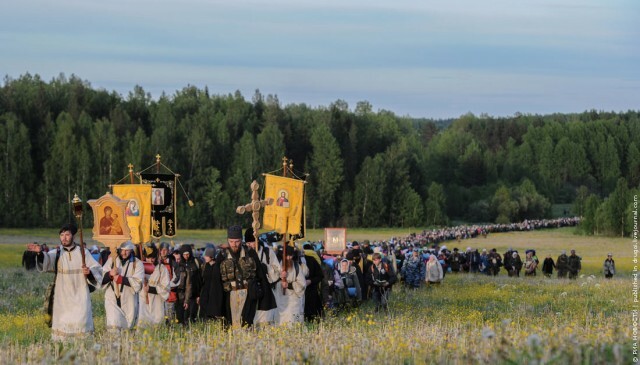 One of the better known annual events is the Velikoretskii Procession around the city of Kirov (Vyatka) that has been taking place for over 600 years each June. Typically, this pilgrimage that honors the icon of St. Nicholas attracts tens of thousands of people. 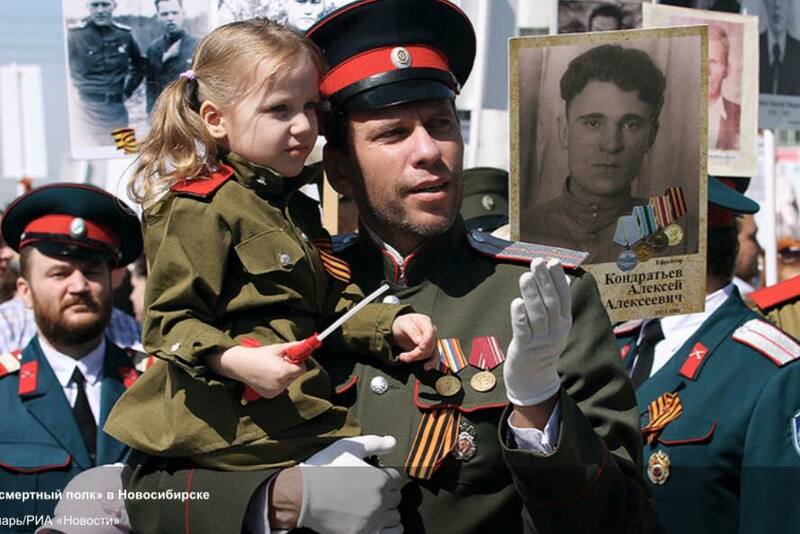 Thus, the Immortal Regiment march combines the visual form that is intrinsic to Russian culture with an event, the function of which is ancestor veneration. All societies around the world, historic and contemporary, subscribe to some kind of ancestor veneration. Of course, this phenomenon does not equate one’s ancestors with deities. Instead, it is used for honoring their life, familial continuity, seeking guidance symbolically or otherwise, and keeping their memory alive in accordance with culturally specific traditions. Germanic peoples of the Viking Age, for instance, had various funeral customs, from grave offerings to ship burials, in accordance with one’s social status. Wealthy ancient Egyptians, too, preferred grave offerings, decorated their tombs, and chose mummification. Ancient Roman nobility opted for cremation and likely displayed funeral masks of its ancestors. Even in today’s globalized societies, where traditional links have largely broken down in the period of atomized Postmodernity, where ties to one’s ancestral home do not stand the chance in today’s uprooted job market, we still treasure family photographs, bring flowers to our grandparents’ graves and light candles for them at our local church. 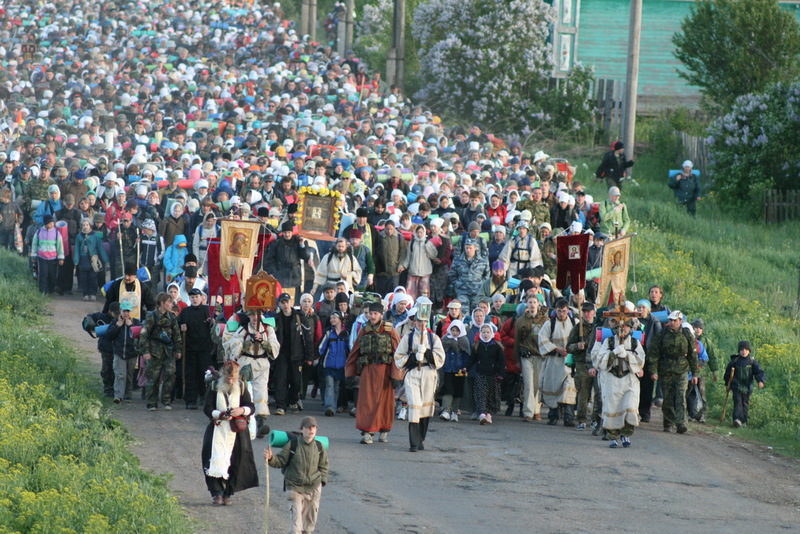 Velikoretskii Cross Procession. Source: arh-eparhia.ru. This combination of form and function serves as an indication of Russia’s coming into its own, as seen through the prism of the sociology of the Imaginary (sociologie de l’imaginaire). This field of study synthesizes the work of Carl Jung on the subject of the collective unconscious and David Émile Durkheim on the collective conscious. It refers to the overt cultural features as the logos and the symbolic factors as the mythos. Post-Enlightenment Modernity in the West and Russia, with its focus on scientific rationality and secularism, pushed the latter into the realm of the unconscious. It is desirable for both categories to be linked directly, where the former is a representation of the latter. There have been many times throughout history when Russia was explicitly under a foreign logos. Peter the Great cut out the proverbial window to Europe, in Alexander Pushkin’s words, orientating Russia’s development to Northern European countries in the realm of architecture, military, and the navy; he crushed various folk ways, for instance, forcing the boyars to shave off their traditional beards. Much later, the idea of Communism, too, came from Western Europe, as the Bolsheviks attempted to rapidly introduce ‘progressive’ values, such as the rejection of the Church and Christian morality seen as part of the overarching social relations, per Marx, to a largely agrarian, staunchly socially conservative society. 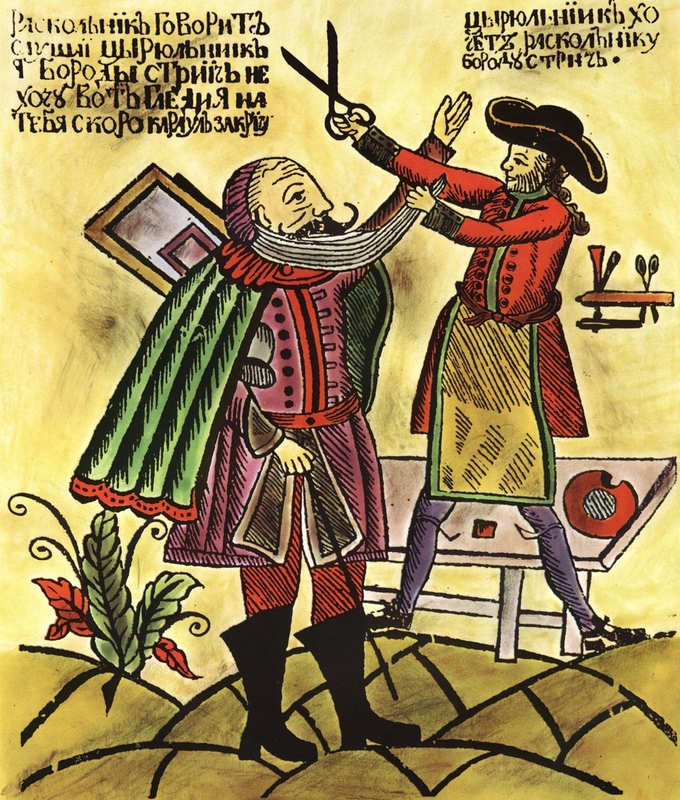 Lubok illustrating cutting off a beard as part of Peter’s I reforms. They failed: by the 1930s, Stalin reintroduced social conservatism of old Russia, albeit in a top-down manner and without property ownership. Stalinist neo-traditionalism included patriarchal family values, pro-natalism, classical literature and the arts, and even bringing back the Church when the Great Patriotic War commenced. This partial return to values (in the framework of Modernity) that were more in line with Russia before the Bolshevik takeover indicates that the foreign logos imported through a violent Revolution is eventually adapted and incorporated into the society over which it presides. That is to say that despite its roots in Western Enlightenment, certain communal aspects of Communism appealed to the applicable counterparts inherent to Russian culture. 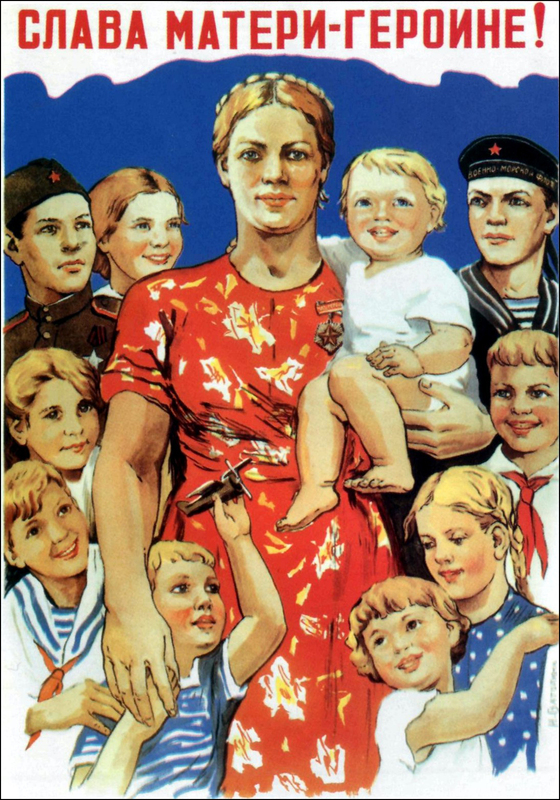 Pro-natalist Stalin-era poster “Glory to Mother-Heroine!”, Nina Vatolina, 1944. After the collapse of the USSR, Russian leadership imported yet another foreign logos—that of globalized mass democracy in a Western-style post-Liberal framework. What followed in the 1990s-early 2000s is the nightmarish McFreedom-and-austerity capitalism, the invisible hand of the ‘free market’ lining the pockets of the very few, demographic collapse, relativist social mores, a vulgar celebrity culture, and an alcoholic president prancing around with American fast-food advertising, to name a few. 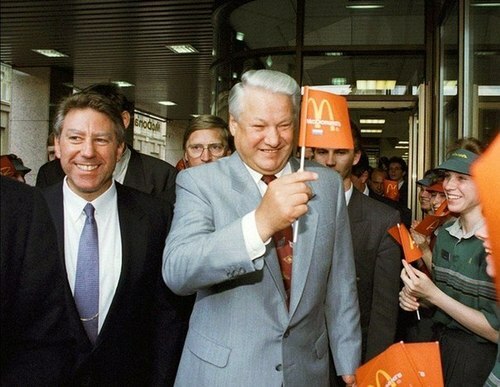 Veneration of fast food in exchange for sovereignty, Boris Yeltsin, 1990s. Today, Russia seems to be slowly asserting its own path, one that has strong links to Europe, but, at the same time, is not Western (in the philosophical sense—Abendland). Whereas many of these globalized factors remain, some are being subverted to channel social conservatism traditional to Russia in surprising ways. Postmodern virtual reality of social networking features patriotic messages and memes, while the long-running dating television show Let’s Get Married reasserts traditional family values and the woman’s role as a wife and a mother above careerism, to name a few. 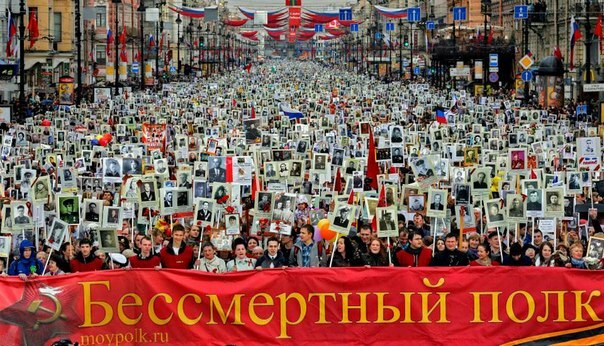 Thus, Russia’s organic Immortal Regiment initiative represents another battle of sovereignty and local traditions against Americanized globalization. 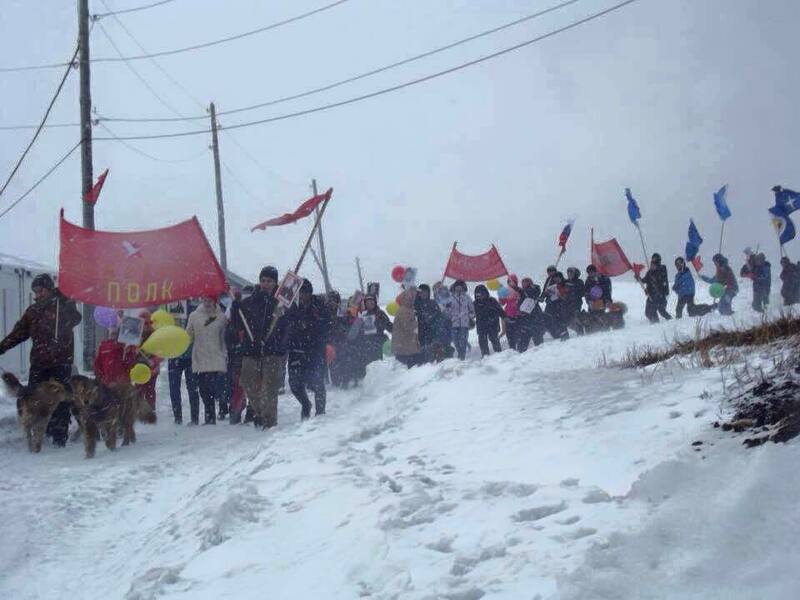 Whereas this step seems small, its millions of supporters make it formidable. It channels primordial ancestor veneration through a specifically Russian Orthodox form, surpassing the immediate context of the Great Patriotic War. 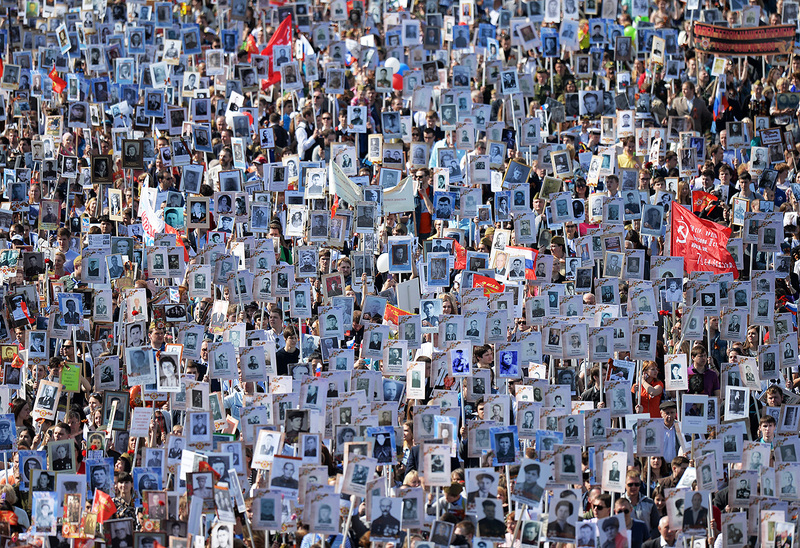 The Immortal Regiment is not only an indication of the War’s socially consolidating, mythmaking quality; it is a hopeful sign of the healthy interaction between the country’s own deep-rooted mythos and explicit logos—its own view of history and culture. Ironically, the current attempt by the Euro-Atlantic West to isolate Russia is not only forcing the country to focus on its domestic market, but, more important, to capitalize on the idea of de-globalization, where possible. This is how we know that the Immortal Regiment marches on Victory Day were sincere: check out the weather in Allaikhovskii district, Yakutia. Source: moypolk.ru. And solve the age-old riddle of the Sphinx. NIna, you are a marvel of intellect, art, and communicative skills. Always deep and powerful, enhanced with glorious images—your writing is a visa for touring Russian civilization. Scythians, Jung, Orthodoxy, the Great Patriotic War, realpolitik, family, mythos and logos—what a feast!